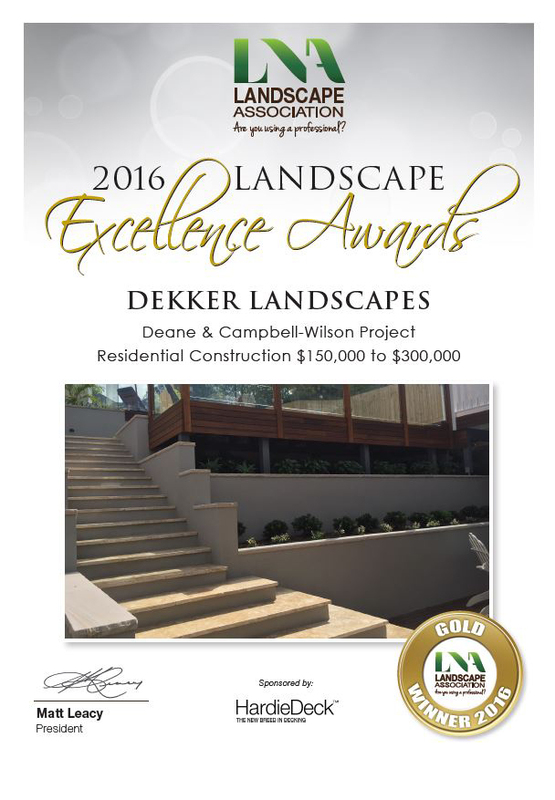 Dekker Landscapes is an award-winning Landscape Design Company serving the greater Sydney area since 2000. The Dekker design process incorporates a comprehensive consultation, site evaluation and Client Needs Analysis. We can implement an existing design if you already have one, or you can simply give us your wish list and we’ll design and build the garden of your dreams. We have the capability to work on any scale, whether transforming rugged acreage into a resort style rural retreat, or a small drab courtyard into an inner city sanctuary. The Dekker team offers the full spectrum of hard and soft landscaping services including, retaining walls, driveways, irrigation, decks, pergolas, pool surrounds, fencing, lighting, water features, plant selection, and more. We offer you the luxury of only having to deal with one contractor, ensuring that all elements of your landscape design blend harmoniously with each other as well as the surrounding architecture and the environment. We also offer a maintenance service to keep the landscaping looking its best every day of the year, leaving you with nothing more to do than enjoy the space. We made the decision to build our own home 2 years ago and engaged Alex Dekker who was referred to us and from the first meeting we knew that Dekker’s was the company for us. We were never disappointed with our decision. Building a home, including landscaping is not for the faint hearted. It can be a very stressful process. Alex has a very calm and confident nature – you would never know the amount of “managing” he is doing at any one time – except for the fact that his phone is silently and constantly ringing during every meeting that we have with him. Alex made the landscaping part of the build happen with a minimum of stress and fuss. We were consulted when needed along the way, yet decisions were made as required too. The guys that work for Alex are polite, hardworking and extremely competent. The garden design was executed with an exceptional level of detail and with a very high standard of care and professionalism. It was a pleasure to have the guys on site, day after day, and this was for a number of months as the landscaping began to take shape. In addition to his own staff, Alex also managed a variety of sub-contractors working on site with ease and professionalism. We have no hesitation in recommending Dekker Landscaping and will be using them again for our next landscaping project. We have a very difficult site with limited access and Alex and his team definitely had their work cut out for them. With their experience and expertise they built us an amazing award winning backyard. The team were always very professional and we would highly recommend. RE: METCALFE STREET, NOISE WALL, CAMMERAY. First let me thank you and your team on behalf of the residents for this magnificent environmental engineering project, what a success it is. The residents are all so impressed by the amazing technology of the walls and delighted with how effective it is in terms of noise reduction. The speed and efficiency of construction, consideration for residents and the effort to minimize the monumental scale of the walls we also thank you for. The landscaping has been extensive and given time will look superb with the wall as a backdrop. The residents are getting involved with ensuring a high survival rate of the plantings we have access to. You can count on the residents to do their best to look after the vegetation. It is so pleasing to stand out in the street, have a quiet conversation, glance over at the sunlit landscaping and think, how fortunate a place we now live in.